Obviously, Denney Pate got it wrong. Denney Pate is a good engineer. He was inducted into the Transportation Development Foundation Hall of Fame in 2011 for his innovations in bridge design. He has been working on bridges and their design for almost 40 years, since he completed graduate school, and several sources repeat the stories of him designing and building his own bridges as a child, starting when he was eight years. By all accounts, Denney Pate is an engineer’s engineer. 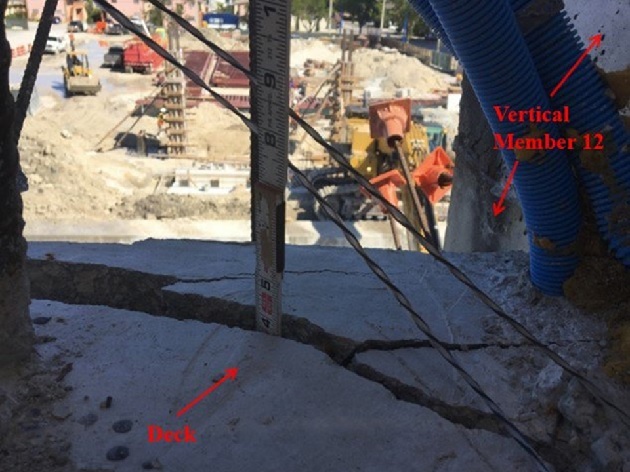 Two days before the FIU pedestrian bridge collapsed on March 15, 2018, killing five members of the public and one worker, as well as injuring many others, Denney Pate noted the cracks in his bridge and concluded that they posed no safety issues. Since then, with the benefit of hindsight, several expert engineers have examined photographs of the cracks and concluded that they should have been seen as red flags that the bridge was an impending disaster. Other expert engineers have examined the plans for the bridge and concluded that there was a flaw in the design calculations that led to the collapse. Knowing that the bridge collapsed, it is difficult to disagree with the conclusions of these experts. At the time, though, the engineer of record, the engineer with the most intimate knowledge of the design and construction of the bridge, believed that the bridge, while cracked, was safe. The National Transportation Safety Board is investigating the bridge collapse. In its August 9 update, the NTSB reported that there were no “notable material issues.” However, they are still investigating, with the dual aims of understanding why the bridge failed and learning how to prevent similar incidents in the future. This is what safety investigations are supposed to do. The NTSB investigation notwithstanding, there are still plenty howling for blood. The first lawsuits were filed within days of the bridge collapse. Reporters looking for soundbites can find any number of people willing to talk about “corporate greed” and “murder”. The bridge collapse is still the subject of a homicide investigation by the Miami-Dade police department. That said, the State Attorney for Miami-Dade, Katherine Fernandez Rundle, stated that criminal charges were “improbable”, adding that she intended to wait until after the NTSB concluded its investigation and only prosecute if the NTSB showed that the collapse was due to negligence. OSHA wasn’t willing to wait that long. On Friday, September 14, OSHA issued citations against five companies involved in the catastrophe: Figg Bridge Engineers, the engineering design firm; Munilla Construction Management, the lead construction firm; Bolton Perez & Associates; Structural Technologies, LLC; and The Structural Group of South Florida. Two of the firms, Munilla and Structural Technologies, were each cited for the same two violations having to do with fall protection. The proposed penalties were $25,868 for each company, the maximum OSHA is allowed to fine for two violations, whether serious or less-than-serious. The Structural Group of South Florida was apparently swept up in this violation as well, although it only received one citation for using the inadequate fall arrest system, with a proposed penalty of $9,054. They were cited because the fall arrest system in place at the time the bridge collapsed did not comply with regulations. Fair enough. Fall arrest systems are in place to prevent serious injuries or fatalities. Too often, we want to believe “no harm, no foul,” but that is not how safety works. These companies failed to comply with well-established, well-understood construction safety regulations. Given the facts disclosed by OSHA, citations would have been warranted, regardless of the FIU bridge collapse on March 15. However, there should be no illusions that proper fall protection would have prevented the bridge collapse. Somehow, OSHA was willing to come to this conclusion independently from the NTSB, the Federal agency charged with investigating the catastrophe. Somehow, OSHA was willing to come to this conclusion, despite the assurance at the time from the most qualified engineer on the site that the crack posed no safety issues. In hindsight, it is easy to agree with OSHA’s assertion. At the time, though, were the cracks “a recognized hazard”? Or perhaps the six-month window in which OSHA has to issue a citation after it begins an investigation was rapidly closing. It is probably no coincidence that September 14, the day that OSHA issued its citations was the last business day after the March 15 disaster it could issue citations. I believe that we are going to learn that there was an error in the design of the FIU pedestrian bridge that led to its collapse shortly after its installation over Southwest 8th Street, in the Miami suburb of Sweetwater. I doubt it will be found to be because of criminal negligence. I also doubt that any of the firms fined by OSHA will appeal, both because lawyers’ fees would quickly overwhelm any reduction in penalties they won and because they feel that they owe a certain penance. On top of that, the penalties are drops in the bucket compared to the damages they are facing in civil suits. It seems unlikely that any firm involved will want to be distracted from their huge legal problems by contesting OSHA. Construction safety and process safety are very different, but they have this in common: they give us the opportunity to make HUGE mistakes. At the time we are making them, huge mistakes don’t feel any different from small mistakes. They don’t feel like mistakes at all. The decision processes that go into making huge mistakes aren’t much different from those that go into making small mistakes, or for that matter, the processes that lead to good, even great, decisions. We live in a world that believes “No harm, no foul,” and worse, “Harm, then foul.” When something goes wrong, there will always be someone eager to point the finger. That means that safety deserves our best effort. More importantly, it means that we cannot rest on our past accomplishments. Denney Pate is not going to be remembered for his brilliant bridge designs or his contribution to his field. He is going to be remembered as the guy who designed that bridge that collapsed in Florida, as the guy who got it wrong, whose decisions resulted in the death of six and the severe injuries of many more. It’s not a legacy any of us want.